Wording inside reads:- Because this birthday’s special just as you are too, everything that’s wonderful is being wished for you. 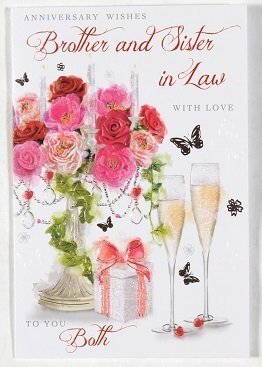 With Love on your 65th Birthday. 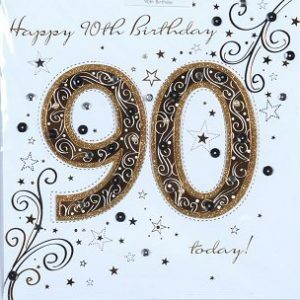 Wording inside reads:- Congratulations on your 90th Birthday. 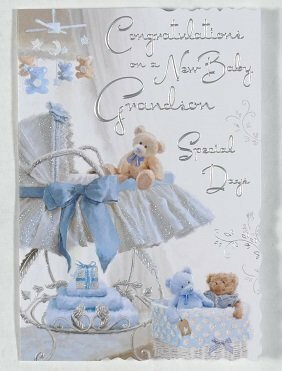 Wording inside reads:- A gorgeous little Grandson, has happily arrived, you must be feeling overjoyed, and bursting full of pride, He’ll bring you many years of pleasure, tears of laughter too, may this priceless, little baby be your special dream come true. 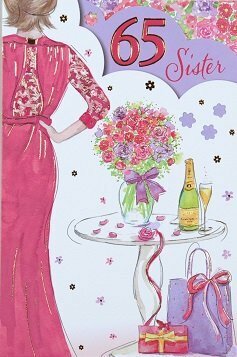 Warmest Congratulations. 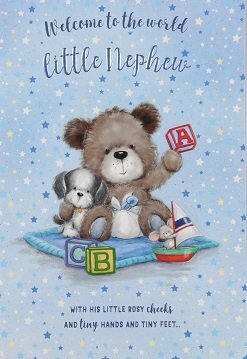 Wording inside reads:- Your precious baby Son, makes all our lives complete. Thank you for a wonderful Little Nephew. 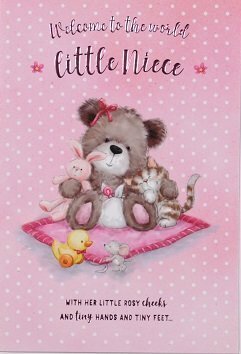 Wording inside reads:- Your precious Baby Daughter, makes all our lives complete. Thank you for a wonderful little Niece. Wording inside reads:- The memories never seem to fade, of such a special day, when you said ‘I do’, exchanged your rings and gave your hearts away. Happy Anniversary. 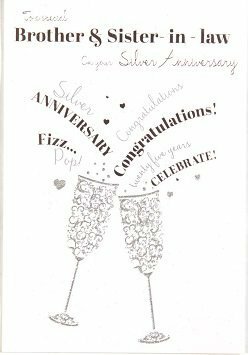 Wording inside reads:- Wishing you a special day, that’s filled with wonderful things, all the love and happiness that a Silver Anniversary brings. Happy Silver Anniversary. Wording inside reads:- Have a wonderful day, enjoy all that it brings, and may it be filled with life’s happiest things. Happy Birthday. Wording inside reads:- I may not often tell you just how awesome you really are. but as far as Brothers go you really are a Star. 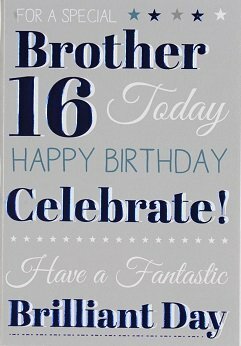 Happy 18th Birthday Brother. Wording inside reads:- I may not often tell you just how awesome you really are. but as far as Brothers go you really are a star! 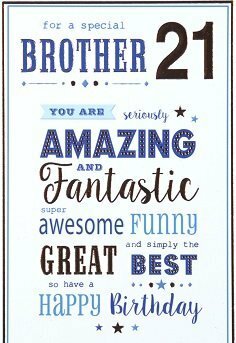 Happy 21st Birthday Brother. 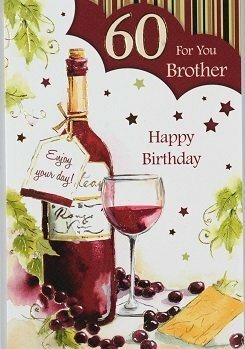 Wording inside reads:- Special birthday wishes are being sent your way, because a very special Brother is 60 years old today. 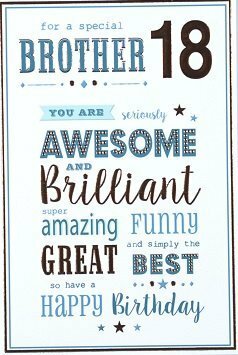 So, here’s hoping that your birthday will be the best one ever, making precious memories for you to always treasure. Happy 60th Birthday Brother. 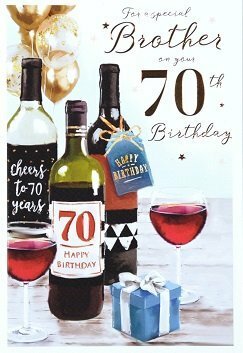 Wording inside reads:- On your 70th Birthday every wish is made for you, for a day filled with happiness, celebration and laughter too. Happy 70th Birthday to a special Brother.